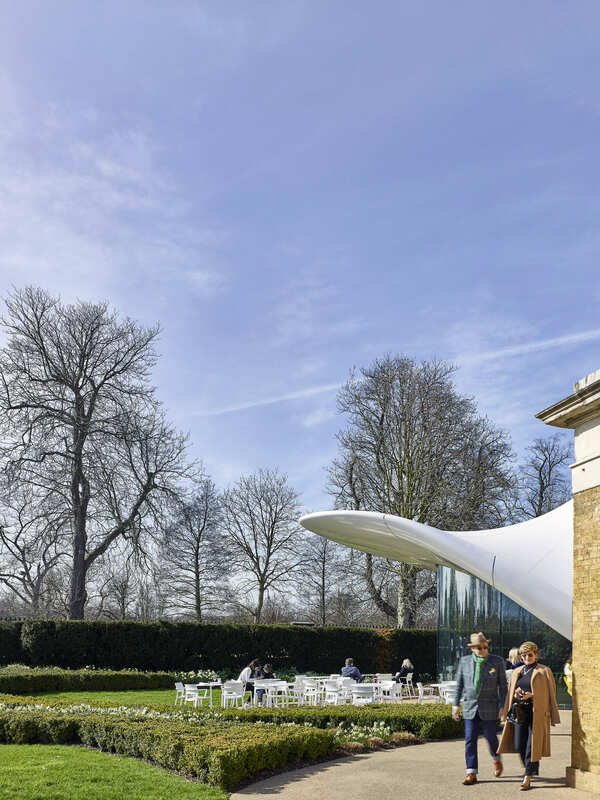 In Kensington Gardens in 2013, Zaha Hadid’s highly anticipated extension to the Serpentine Gallery, the Serpentine Sackler Gallery, opened to the public. The project included the renovation of a 200-year-old former gunpowder store to create new gallery spaces, as well as creating a new café and events spaces that curved and extended from the original, old brick building. The Sackler Gallery’s new events space was built from a glass-fibre textile, with the tensile structure forming a free flowing white canopy. Appearing to grow naturally from the one-storey gallery building, the roof of the new annex stretches down to meet the ground at three points, and is bordered by a glass wall that curves around the space. Inside the café, five tapered steel columns support the structure, including the framed oval skylights. 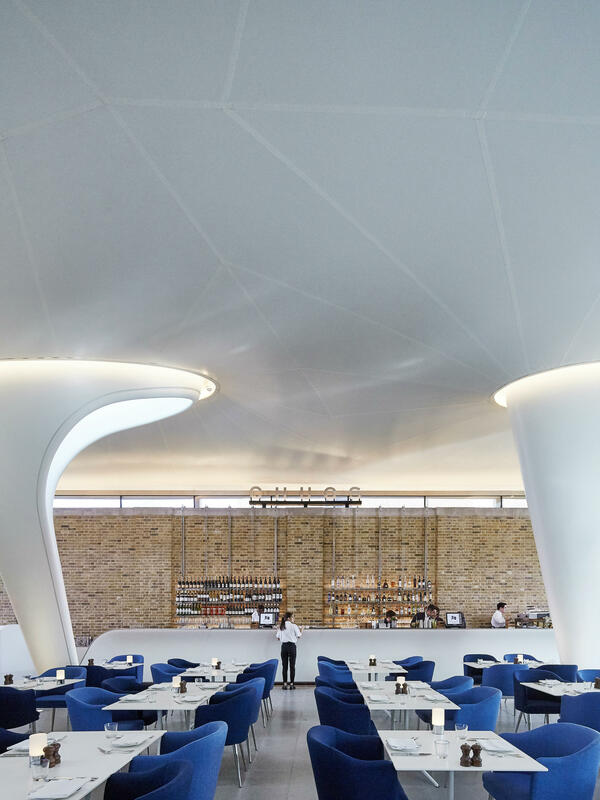 Zaha Hadid’s innovative design may have been around for a while, but in 2018 it took on another life – becoming home to the restaurant, Chucs Serpentine. 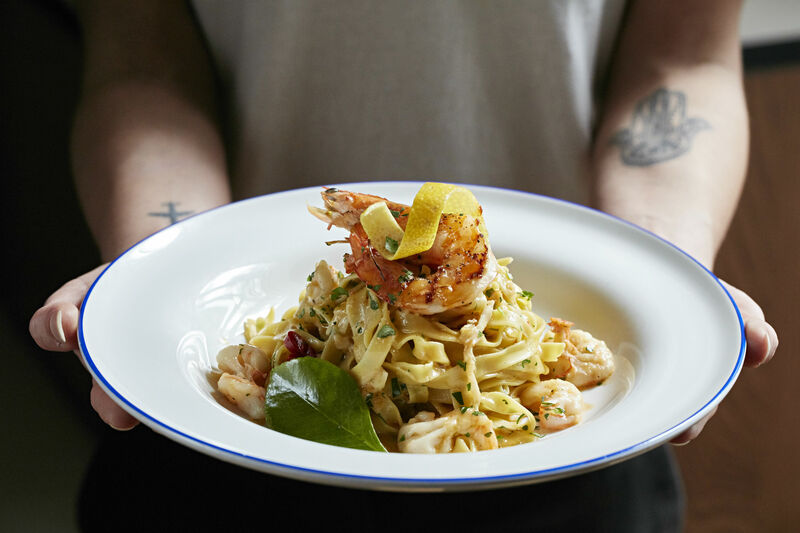 Bringing a new lease of life into the events space, Chucs took over the iconic structure, offering casual food and beverage options to everyone from those visiting the Sackler Gallery to guests spending time in the surrounding Kensington Gardens and Hyde Park. As part of its offering, Chucs Serpentine has recently created a Supper Club series, which sees renowned British chefs delivering exceptional menus for one night only. The first two Supper Clubs have already taken place, and the next is planned for the summer of 2019. With the restaurant celebrating its first anniversary this month, and the Supper Clubs offering diners a once in a life time experience, we spoke to the Chucs team to find out why having a restaurant in Zaha Hadid’s iconic space means so much to them. What does it mean for Chucs to be celebrating its first anniversary at Serpentine? Chucs’ first year at Zaha Hadid’s Sackler Gallery has been an absolute privilege. From our soft launch in April 2018, through to a bustling summer season, and Autumn-Winter jam-packed with exceptional events curated by our dedicated in-house team, it’s been a busy twelve months to say the least. As a team, we’ve developed a deeper understanding of this incredible building and its situation, as well as how the public engage with the space, in the context of the seasons. What makes Chucs Serpentine different from the other restaurants? 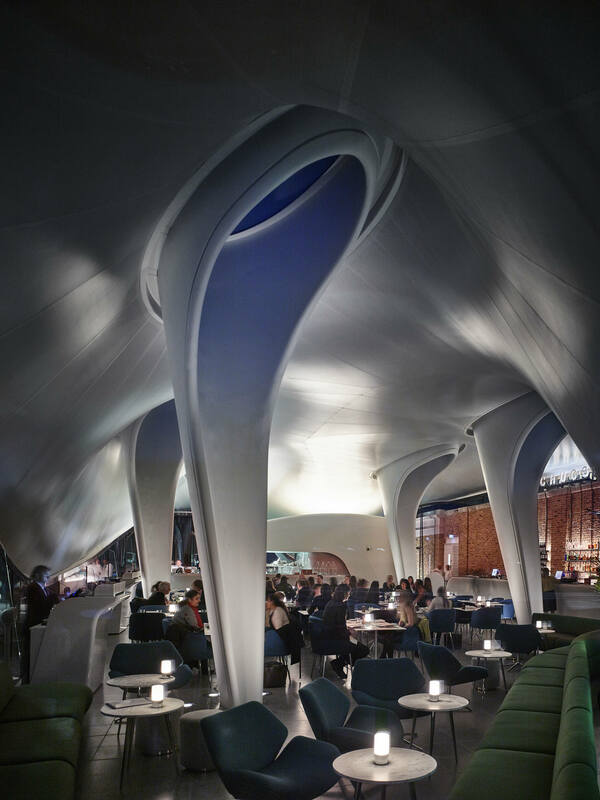 With its sculptural columns and undulating roof, Chucs at the Serpentine Gallery is a strikingly different space from our Mayfair, Westbourne Grove and Harrods restaurants, which are known for their warm wooden panelling, perfectly polished brass rails, and vintage black and white shots of the Amalfi coast. At the Serpentine, Hadid’s architecture itself is the work of art, and we were keen to ensure nothing should detract from this. Chucs at the Serpentine also marks our first venture into a more casual café concept – whereas our previous three venues are fairly formal, we wanted visitors to our Serpentine space to have the option of taking away fresh coffee, smoothies and snacks, to be enjoyed alfresco in the Royal Parks. 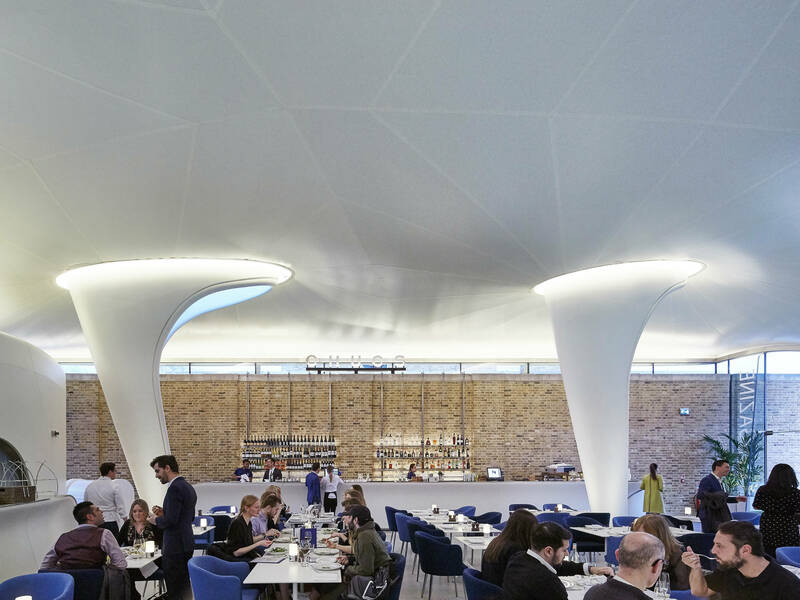 Why create a restaurant within the Serpentine Sackler Gallery building? It’s not every day you’re presented with the opportunity to work alongside an organisation as highly regarded as the Serpentine Galleries, and it’s a real honour for Chucs to align ourselves with such an established institution. Zaha Hadid’s renovation of the Magazine, and the iconic extension, are both truly unique and breath-taking spaces. Their position in the centre of Hyde Park and Kensington Gardens is surely second-to-none – what better spot for a new Chucs? What are your thoughts on the building? It’s an incredibly striking building in that it’s formed of two distinct parts, the classical Palladian portico and Hadid’s avant-garde annex - the coming together of old and new. It’s a space we’re very proud to occupy. As a collection, Chucs has opted to establish sites across some of London’s most prominent locations. To say it is a huge privilege for Chucs to occupy such an iconic space as the Sackler Gallery annex would be an understatement. Hadid’s creation represents a coming together of food and culture, a merging of concepts we strive to achieve at Chucs. Why do you think Zaha Hadid’s design is so important? At Chucs, we believe appeal doesn’t start and end with the plate; dining out is a multi-sensory experience, and architecture and interior design are both fundamental elements. 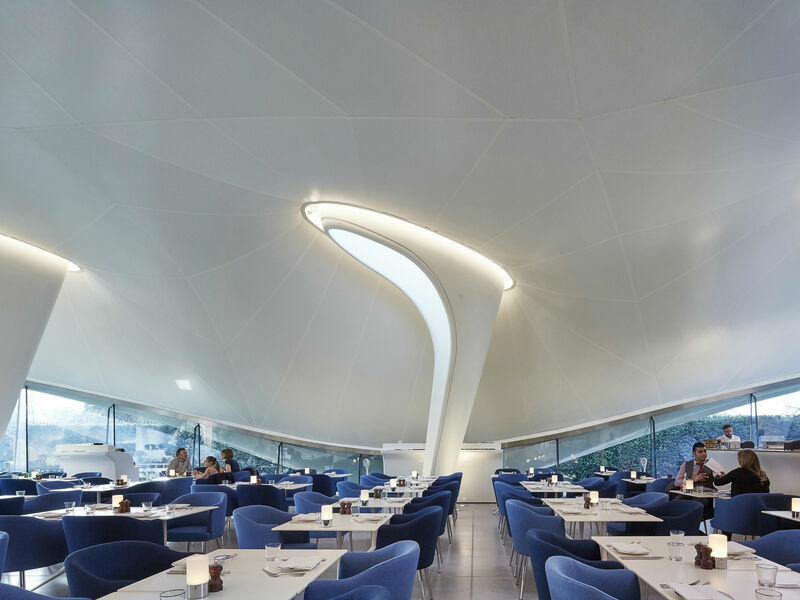 With its lofty canopy and oval skylights, Hadid’s design is a truly inspirational space, transporting diners from the drudgery of day-to-day life to an almost alternate reality. How do diners react to the architecture, and what feedback have you received on the restaurant? It’s difficult to imagine that any visitor to Chucs Serpentine could fail to be impressed by Hadid’s design. The building can feel quite different depending on the time of day – guests visiting for a mid-morning coffee are impressed by the bright and airy quality created by the glass walls and cascading light from the bold, oval skylights. In the evening, visitors arriving for dinner or a private event are awe-struck by the structure’s undulating silhouette. We can only hope that the quality of the food and overall dining experience lives up to this world-class architecture. Where did the idea for the Serpentine Supper Series come from? The seed was sown by the owner of Chucs himself, entrepreneur Peter Dubens. A long-time friend of Ruthie Rogers, Peter approached Ruthie and her River Cafe team regarding a potential collaboration – an unforgettable, sell-out night followed in November 2018… and so the Chucs Serpentine Supper Series was born. Why choose to have the Supper Series at the Serpentine Gallery? As a team, we couldn’t have dreamt up a more perfect setting in which to host the Chucs Supper Series than our space at the Serpentine – a spectacular backdrop against which to savour outstanding food. Hadid’s iconic design arguably helps represent the presentation of cooking as an art form. The open-plan kitchen provides the perfect setting for a collaborative dinner, with guests able to witness the technical and creative prowess of some of Britain’s finest chefs first-hand. The building’s undulating glass walls add a further sensory dimension, creating a remarkably different experience depending on the season. In the summer, the verdant Hyde Park & Kensington Gardens seem to become an extension to the restaurant itself; in the winter months, a blanket of darkness only adds to the sense of privacy and tranquillity, with the Serpentine twinkling in the distance beyond. To stay up to date with all things Chucs, including our Serpentine Supper Series, please visit www.chucsrestaurants.com.